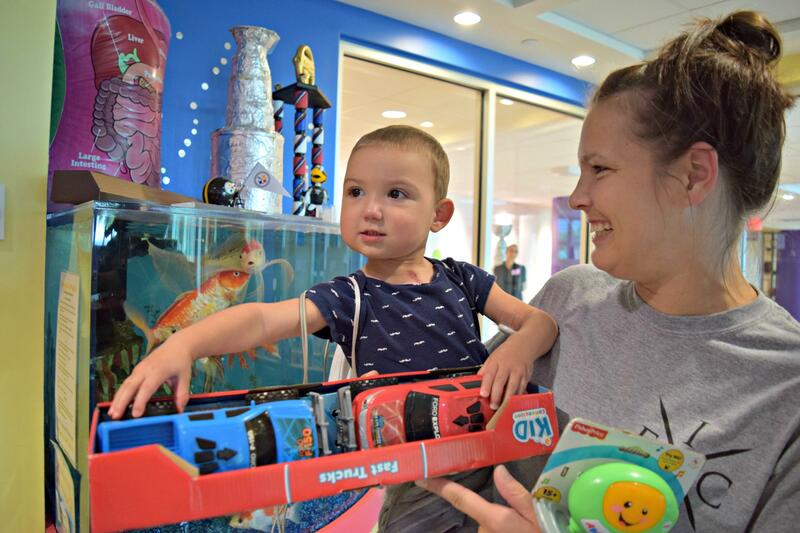 A child at UPMC Children's Hospital receives a toy from Cuddles for Kids, which donates toys and stuffed animals to hospitals. When Conner Hagins was 9 years old, his father had a double bypass surgery. While recovering, his father was given a teddy bear to hold against his chest while coughing or sneezing in order to help protect his chest wounds. But it was only cardiac surgery patients who were given teddy bears, Hagins found. “From that moment it was almost a light bulb idea,” Hagins said. That’s when the young Hagins founded Cuddles for Kids. It’s been 10 years since he started the organization, which has given out more than 100,000 toys and stuffed animals to children in hospitals. Now a college student, Hagins continues to spread his message of love. This month, Cuddles for Kids delivered nearly 700 toys to UPMC Children’s Hospital. The donations left the shelves inside Austin’s Playroom, located on the sixth floor, fully stocked. Sometimes Hagins will stop to watch the children play after Cuddles for Kids drops off donations. Hagins is currently studying business at LaRoche College. He’ll be a sophomore in the fall and his mother, Robin Hagins, said she couldn’t be more proud of him. “He’s a typical boy, just with a heart of gold,” she said. Tracy Organ Cease spends every Monday, Wednesday and Friday at the Northside Common Ministries kitchen preparing lunch. Coffee in hand, he also meets with his lunchtime diners and makes sure they’re connected to any other services they may need. “It’s very humbling to be at the point where you may need to go and get this kind of assistance to be able to eat today,” Cease said. And Cease would know. It wasn’t long ago that he was the one getting a free lunch, rather than making it. That’s why he tries to provide an inviting atmosphere to those he serves. For 13 years, Edith Davidson and Diana Cooper have met with women to talk about all aspects of their roles as new mothers. For the last several years, the gatherings, known as “Stork Bites,” have been held at the Sharon Community Presbyterian church in Moon Township. Davidson and Cooper divide the Stork Bites meetings into six-week classes, with many of the mothers attending multiple sessions. “I prayed and I just got the idea … and the name in one night,” Monteleone said. That was the birth of Art. Healing. Hearts. For some receiving treatment for cancer, Mrs. Claus doesn’t just visit at Christmas. “Our mission statement is to bring comfort, hope, encouragement and love to the (person) who has been recently diagnosed with cancer,” said Jeana Watenpool, founder of the Mrs. Claus Club of the North Hills. The Mrs. Claus Club, which delivers gifts minus the sleigh year-round, has given out more than 500 comfort baskets since it was formed seven years ago. In the last seven months alone it has delivered more than 70 baskets.